Our Bellevue Cosmetic Dentists at Brookside Dental in Bellevue, Wa, recommend the acquisition and use of a night guard in certain instances when we set anterior porcelain veneers to keep them from being chipped or cracked. The use of a night guard in some cases will help preserve the new smile that has been created with the porcelain veneers. 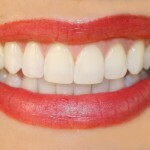 The reason or reasons that a night guard, which is sometimes called a bite guard, can protect your new teeth in several ways is because it is a custom made plastic shield that is designed to protect your individual smile. Night guards usually are recommended by your Bellevue Cosmetic Dentist for any of several dentistry problems. Bruxism is generally the most common reason that a night guard is recommended by your Seattle Cosmetic Dentist, which can be either grinding or clenching of the teeth. This most often occurs at night, but may occur during the day. It is a destructive habit that can cause damage to the teeth or to porcelain veneers and their supporting bone structure as well as the jaw joint. Bruxism can wear the teeth down through the enamel and into the dentin of the teeth, loosen the teeth by destroying the supporting bone or often can cause very sore jaws or jaw joints. A night guard, which is worn at night, can help control these bruxism problems by distributing the biting forces more evenly around the mouth. Additionally, the night guard acts as a physical barrier to any potential direct physical friction or trauma between the teeth of the upper and lower jaws. A Night guard can protect smiles by assisting loose teeth to become more stable to some degree. It allows the teeth to rest when the biting forces are more evenly distributed during the bite and does not allow major jaw force to be exerted on the individual teeth. This may allow loose teeth to become more stable because they are not being moved or rubbed against on a regular basis by other teeth. At Brookside Dental, we recommend the use of a night guard in certain instances after we place new anterior veneers are placed to protect the teeth and new porcelain veneer smiles from the problems that can result from bruxism. The bite guard will assist to preserve and protect the overall beautiful appearance of any new smile that is created with anterior porcelain veneers. Adjustments may be required for an existing night guard when any major dentistry is performed. Generally, any night guard adjustments that are needed are usually minor and are easily done during a regular dentistry visit without a special visit to your Seattle area dentist. For the teeth to function in a proper manner adjustment of the bite may be needed. A night guard also is able to assist in the bite adjustment process and as well as it can help maintain the final bite position and tooth arrangement that is accomplished for the new bite. Inspect and examine your night guard regularly for flaws, cracks or rough areas. After using your night guard for some amount of time, shiny spots and wear grooves may appear on the biting surface and the edges may become rough. Generally, these are just areas and marks that occur with normal wear. However, they should be examined regularly each time you have regular dental appointments to prevent any potential problems such as a broken night guard or sores in your mouth. If there are any problems with the night guard, it usually can be repaired by your Bellevue Area Dentist, while in a very few instances a new appliance will have to be made for the patient. Night guards should be cleaned on a regular basis each morning after using them by brushing them with a toothbrush and toothpaste. There is no need to store them in any special solution because dry storage is just fine. However, storage of night guards in the special box that they come in will help protect them from accidental breakage from small children and pets. Many people tell us that their dog ate their night guard or someone sat on it and broke it along with other stories as to why they do not use it on a regular basis or do not have it for repair. As one of our dentistry procedures in our Bellevue Dentist Office, we are able to clean night guards ultrasonically to remove any tartar that has accumulated on them and inspect them thoroughly to determine if any adjustments or repairs are needed. Athletic mouth guards are made differently than night guards and have a different use which we will discuss in another blog post. For additional information on Dentistry Night Guards, please call our Bellevue, WA, office at 425-643-2818. The primary importance of using night mouth guards is to keep your teeth and your smile. It helps also in improving the quality of sleep in an person.Thank you for sharing this information. Wonderful blog. Plenty of helpful info here. I am sending it to several pals ans also sharing in delicious. And certainly, thanks to your effort. Thanks for creating such a wonderful site. this site was not only knowledgeable but also very stimulating too. We find very few people who can think to create articles that creatively. I have gone in detail through dozens of blogs to come across know how about this. Looking to many more from your site !! Night guards are one of the best tools for great looking teeth. I see people all day long who have a grinding problem at night. This is a simple solution and a great article. Thanks for the great comment Dr Stan. We do like night guards for a variety of dentistry situations and as you point out they are great for people that grind their teeth. Thanks again. Thanks for the comment. Yes NGs are great for grinding problems. I haven’t heard this concern until now. Thanks for the information. I guess I might check this one out ans and see if I have to get one of these for better oral guard. Thank you so much for your great blog. You have shared very informative blog with us. I couldn’t agree more. The use of night mouth guard is very important not only smile-wise but health-wise too. Night mouth guards don’t just protect your teeth from getting scratched and broken. It can also keep you away from the headaches and jaw pains. Great comment Michigan Dentists and thanks for visiting our blog. I visited your website and found it very nice. I especially liked the video regarding the fund raiser for the cancer patient. Thanks for giving back to the community, it is something we believe strongly in doing. It’s been estimated that over half of all adults grind their teeth at night. In addition to discomfort of the jaw and muscles that this can cause, it can also damage your teeth or dental work. Philadelphia Dentist thanks for the great comment and info. I visited your website and it is very nice. Great tips! Thanks. True. Teeth grinding does not only disrupt your partner’s good night sleep, it’s definitely destructive to your teeth, gums, and jaw. Thanks for the comment and your thoughts. Night guards can be a great relief for everyone as you state. Do you think that a snoring person may be more tolerable than a person who grinds his or her teeth while asleep? Thanks for the comment Dr Calvo. Couldn’t agree more. Night guards are effective in controlling the damage that is done by bruxism, or the grinding and clenching of the teeth. Thanks it was a nice read on night guard. Thank you for your comment on our night guard article.